The due dates for Canadian tax returns, as well as taxes due, depend on how your business is structured—there's no one-size-fits-all deadline. The fiscal year you choose can figure in as well. Declare your income on Form T2125 if your business is a sole proprietorship or a partnership. This form is part of the T1 personal income tax return. You have until June 15 to file your Canadian income tax return, but beware—even if you're not filing your tax return until June 15, you must still pay any income tax due by April 30 to avoid penalties. You can choose to use a business fiscal year other than the calendar year when you're a sole proprietor or partner. For example, it might be advantageous to use a fiscal year that ends when business slows down if your business is seasonal. You must apply to the Canada Revenue Agency (CRA) to change your fiscal year end. Approval isn't guaranteed. The CRA might reject your application if it believes that your request isn't based on "sound business reasons." All partners must choose the same fiscal year end if you're in a partnership. You can't change the fiscal year end if one of the partners is a corporation or is in another partnership. Filing your taxes becomes more complex if you do decide to use a business fiscal year end other than December 31. Regardless of the date you choose, your personal tax return is still due on June 15 and you must pay any taxes owed by April 30. If your business fiscal year end is not December 31, you must combine parts of the two fiscal years. This might require estimating your income from your fiscal year's end to December 31. Most sole proprietors and partnerships choose a December 31 fiscal year end for this reason. You can choose any date for your fiscal year end if your business is a corporation, but if the corporation has a balance owing on its corporate income tax, that tax balance must be paid within two months after the fiscal year end. Canadian-controlled private corporations are an exception to this rule; they have three months to pay their income tax balance if certain conditions are met. Corporations must also pay provincial taxes in each province and territory in addition to federal business taxes. 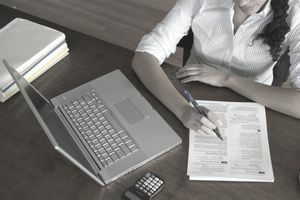 With the exception of Quebec and Alberta, provincial corporate taxes are administered by the Canada Revenue Agency and included on the federal tax return. See the Corporate Income Tax section of the Treasure Board and Finance website for the appropriate forms if your place of business is in Alberta. For Quebec, visit the Corporate Income Tax Return section of the Revenue Quebec website for corporate tax return forms and information. Filing and tax payment deadlines are similar to the CRA requirements. What If Your Business Didn't Make Any Money? If your business is incorporated, you're required to file a T2 tax return every year regardless of whether your company owes any tax. Sole proprietorships and partnerships must file individual returns regardless of whether they have any business income to report. If your business is active, you should complete and include form T2125 with your personal tax return. You might have incurred business expenses even if your business had no revenue, generating a business loss that can be written off against other personal income. For example, you might have started a small business on the side in addition to your regular job. Your business might not generate income in the first year or possibly even in the first few years, but it has startup expenses. These expenses can be written off against the income from your regular job, although there are limits.